I don't know Louise, but I will agree that this little basic yoke is beautiful. Her smocking is superb. 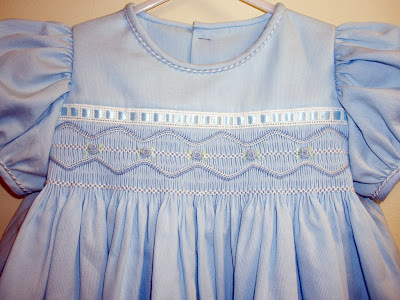 I love the ice blue color and the beading used in place of piping. So pretty. Curved smocking is not my strong point. I love the way it looks but haven't taken the time to sharpen my skill with it. On the to-do list with a million other things. Beautiful, I like it better in blue than the pink version in AS&E, can't believe this "pink" girl is saying that. The beading is wonderful. I would love to know if it is stitched on top of the smocking or if the smocking is attached to the entredeux part.Either way it is beautifully executed and does not look easy to pull off. 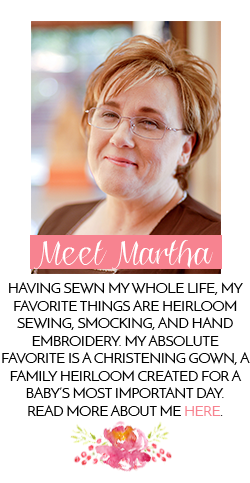 Thanks for the pic, Martha. Bunny it's featured on the front cover of AS&E #84 in pink. The beading is zigzagged to the front yoke just at the seam line and the ribbon threaded through before the skirt is attached. It is beautiful. I can never seem to make mine curved either. Mine end up looking more like zigzags. I wish someone was next to me helping me make those curves so I could figure out what I was doing wrong. But your things are always gorgeous Martha. I bet you are better at it than you know. Happy Smocking.